The Purple Door Detective Agency is hiring. Those without magic need not apply. Apply at the agency. No phone calls or psychic links. Sunshine Merryweather is a young witch with a passion for colorful clothes and good food. She is the owner/operator of the Purple Door Detective Agency. Her partner, John, was brutally murdered three days ago, and she won’t stop until she finds his killer. Aine is only interested in one thing when she walks into the building with the purple door–locating the last man alive in the branch of the O’Neill family she haunts as a beane sidhe. She has been asleep for 200 years in a ruined Irish castle and realizes that the world has moved on without her. She needs to find the O’Neill heir and encourage him to start a family or she will pass from existence when he dies. Sunshine sees a potential partner when she looks at the powerful beane sidhe – they could be the next Dynamic Duo! But Aine isn’t interested in Sunshine’s schemes – until the witch agrees to help her locate O’Neill. Even then, it will be a short-term association at best from Aine’s point of view. She has no need of witchcraft. Neither woman is aware of the danger they face as an ancient assassin stalks the old port city of Norfolk, Virginia. It will take more than simple witchcraft or beane sidhe magic to stop the killer. They will have to work together and combine their talents. But can Sunshine and Aine put aside their differences to stop the murders without tearing each other apart? 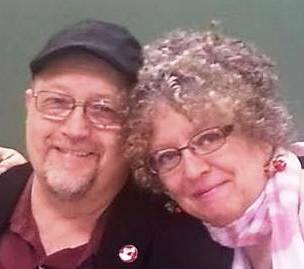 Joyce and Jim Lavene write award-winning, bestselling mystery fiction as themselves, J.J. Cook, and Ellie Grant. They have written and published more than 70 novels for Harlequin, Berkley, Amazon, and Gallery Books along with hundreds of non-fiction articles for national and regional publications. They live in rural North Carolina with their family. 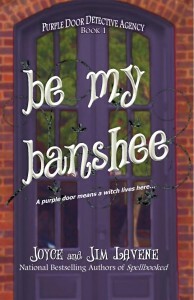 Review (4 Stars): Be My Banshee is a delightful cozy mystery with a fun cast of characters that are sure to entertain. I loved Sunny and Aine as a mystery solving duo and there were quite a few laugh out loud moments when these two are together. The mystery was well-written and full of plot twists and this is a great start to a new series. Looking forward to reading the next adventure of the Purple Door Detective Agency. They have so many great ideas! Joyce and Jim Lavene are amazing writers, and I look forward to reading their books. Thanks for hosting us here on our blog tour!